The Call to Adventure | Write Your Own Story! Like many people, I am living an inauthentic life. This is an easy trap to fall into. Don’t get me wrong. I am in love with my Wife and I adore my Kids. It’s my job. I spend all day writing business proposals to sell parking meters and citation processing services to municipal government agencies. God has an impeccable sense of humor, since I have accumulated thousands of dollars in parking ticket fees and fines over the years. I’m the City‘s best effing customer. It’s not that I dream of selling something more interesting, or something more prestigious. 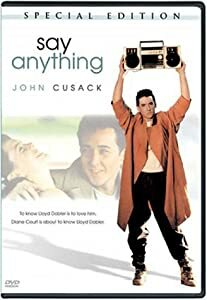 To paraphrase the legendary Lloyd Dobler, I don’t want to sell anything, or buy anything or process anything. I want to write Stories. I don’t want to do anything else. Everyone has a dream that they harbor in Secret Places. The reason that it often stays hidden is because dreams are usually impractical. I have a stable career. We have mouths to feed. A mortgage to pay. My Wife‘s Groupon addiction to finance. How many furnace cleanings does one house need anyway? I’m afraid to to take any Risks. That’s my problem. In order to realize a Dream, one has to be Fearless. I have to embrace the Call to Adventure. You know who else was living an inauthentic life before his heroic quest? Luke Skywalker. He was pining away on his moisture farm, longing for excitement and adventure, cleaning his droids, when bam, adventure came calling. Or Neo. He was toiling in a cubicle when his heroic opportunity to do IT-related kung-fu in The Matrix arose. My Call to Adventure is here. I have to embrace it. This entry was posted in For Inspiration and tagged Business, Lloyd Dobler, Luke Skywalker, Park, Parking meter, Say Anything, Traffic ticket, United States. Bookmark the permalink. That is an awesome would-be Adventure. What’s holding you back? How can we get you there? Hi! If you have a moment, can you please hit the follow button on my blog again? We changed our domain, and I’d like to stay in contact to see if maybe you have found an alternate route to your adventure. Thanks!